If you have read any of our posts you know that when it comes to choosing hair products we try to avoid unhealthy ingredients like sulfates and silicones. For this reason, we always prefer to use natural oils instead of synthetic counterparts. 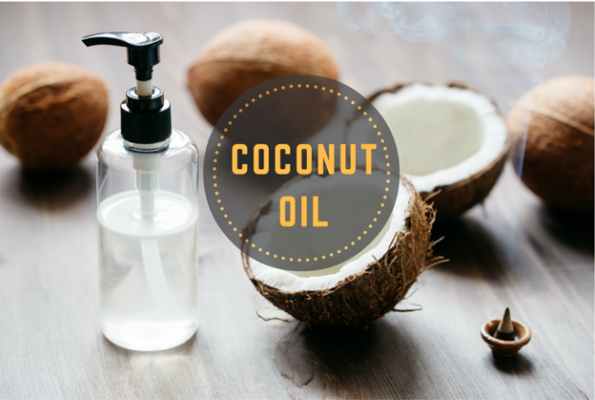 And, when it comes to selecting a natural oil for the hair, we have found that coconut oil is a hard one to beat. Let’s face it; good hair products can be expensive. Coconut oil, on the other hand, is really inexpensive—a 14 oz. jar of organic coconut oil costs only about $8 or $9. When you consider just how long a jar lasts, this amazing oil is super cheap! Since it is so inexpensive, always go for the best coconut oil you can find—organic, virgin and unrefined oil is ideal for your hair. When shopping for coconut oil, be aware that any jar of coconut oil sitting on a store shelf will most likely be in a solid state. This is because coconut oil is always solid at room temperature (anything below 76 degrees). For ease of use, you can quickly melt the oil. All you need to do is transfer what you need into a small glass and then place the glass in a bowl of hot water. Your solid white coconut oil will easily liquefy! You can use coconut oil both as a pre-shampoo treatment and as a post-shampoo solution to tame frizzy hair. To use the oil as a pre-shampoo deep conditioner, start by setting aside a few tablespoons (or even a bit more, depending on your hair length and thickness) in a small bowl. Massage the oil into your dry or damp hair (some claim that the oil spreads more easily through damp hair), focusing mid-shaft to ends since this is where the hair is typically the driest and most damaged. As you apply the coconut oil, try to avoid the scalp area if you have fine or oily hair. 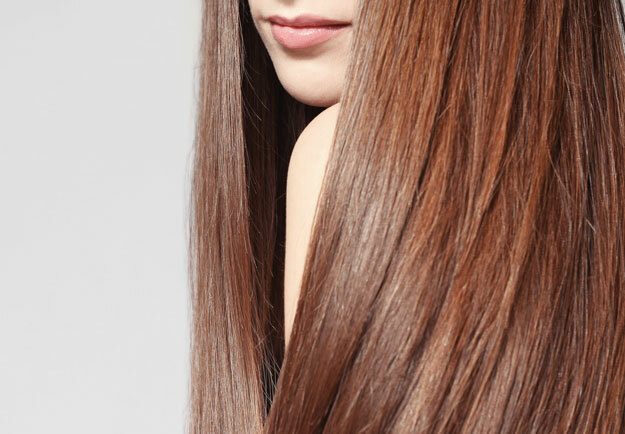 After applying the oil, comb your hair with a wide-toothed comb to help distribute it evenly. Let the coconut oil sit on your hair for 30 minutes or so and then shampoo and condition your hair as you normally do. The result: softness and shine! If your hair is particularly dry or damaged you many want to leave the coconut oil on overnight—just pile hair into a bun and cover your pillowcase with a microfiber towel to avoid staining your sheets! If that sounds too inconvenient (or too messy), you can also boost the benefits of the oil by applying some heat via your blow dryer for the last few minutes of the 30-minute waiting period. Note: The ideal amount of coconut oil that you really need to use for this deep conditioning process is based on your hair type, condition and length, so you may need to do the treatment a few times before you settle on the perfect amount to use for your hair. A tip…if after your first treatment your hair is flat or feels weighed down, you absolutely used too much! Another great use for coconut oil is as an all-natural replacement for those store-bought anti-frizz finishing serums and oils. Just rub a dime-sized amount into your fingers and lightly smooth over frizzy ends or flyaways. Remember (as mentioned above), since coconut oil is hydrophobic and repels water, it also works to prevent moisture from entering the hair shaft to stop frizz from forming in the first place. In addition to being a wonderful conditioner for the hair, coconut oil has natural antifungal properties, making it perfect for preventing and soothing dandruff. For a DIY scalp treatment, just take several tablespoons of the oil and massage it into the scalp. Let it sit for 60 minutes or longer and then shampoo as you normally do. No more white flakes! On top of managing dandruff issues, coconut oil is also great for moisturizing and soothing a dry, itchy scalp, a common problem in winter. Finally, coconut oil also has a natural SPF of about 5 or 6. In addition, coconut oil also protects hair from absorbing chlorine. So when you plan your next summertime outing at the beach or pool, just dampen your hair and apply a bit of coconut oil before you go—as you enjoy the outdoor fun you will be conditioning your hair and protecting it from chlorine and the sun. An all around win-win for summer hair care!